In March human rights defender Sikhosipi Rhadebe was murdered by unknown persons, having worked for years to advance the cause of the Xolobeni community, whose livelihoods are negatively affected by mining operations in the Eastern Cape province. During the first weeks of October 2018, several towns in Johannesburg experienced protests by residents following the killing of a woman during a crossfire shooting allegedly between gangs while she walked her son home from school. Protesting against the continuous crime in the area, drug dealing and the corruption within the police force in dealing with these issues, residents in Westbury burnt tyres and blocked roads, demanding that security forces be deployed to the area to tackle the increasing crime. Solidarity protests also erupted in other areas of Johannesburg such as Ennerdale. Activists in Cape Town also issued a statement in solidarity with the Johannesburg protests, where they demanded training of police officers on protest management, due to the "heavy handedness" in the way the police deal with protesters. Two people were arrested for public violence and were later released. Hundreds of residents from Bishop Lavis & Elsies River took part in a peaceful protest against crime & gang violence. Will protest marches ever stop gang violence, or do we need a strong government that will eradicate gangs by making it illegal to be a member of a gang? On 12th September 2018, residents of the Cape flat community in the Western Cape province blockaded roads in protest against increasing crimes, mostly perpetuated by gangs. According to crime statistics released a few days before the protest, the Western Cape had 808 gang-related murders in 2017r, a figure which translated to 83 percent of the total figure nationally. The crimes have mostly been concentrated in Cape Flats suburbs such as Bishop Lavis‚ Elsies River‚ Kensington and Bonteheuwel. 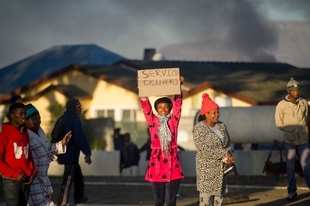 As the wave of protests continued, on 25th September 2018, it was reported that protestors blocked several roads in the Western Cape province to demonstrate against poverty. The protestors decried the growing unemployment rates, and the lack of economic access to other basic needs such as food, water, electricity and transportion. Also highlighted was the increasing crime rates in the area. South African law allows for many types of NGOs to be formed, from community-based organisations to trusts and non-profit organisations. South African law allows for many types of NGOs to be formed, from community-based organisations to trusts and non-profit organisations. Registration is not mandatory, however many groups choose to register formally as non-profits under the Non-Profit Organisations (NPO) Act 1997. Registration as an NPO allows access to public funding (through the national lottery for instance) and tax exemption status. As of 2012, it was reported that over 80,000 NPOs had been registered. Civil society has criticised government for being too quick to deregister organisations due to non-compliance when they have not established the necessary appeals and arbitration mechanisms. Civil society has also criticised a proposed government policy on NPOs to replace the current system with a new body designed to improve the quality of reporting and compliance. A draft law due for release in 2016 may address these concerns. There is a culture of protest in South Africa with thousands of protests taking place each year; most are peaceful and focused on local issues. There is a culture of protest in South Africa with thousands of protests taking place each year; most are peaceful and focused on local issues. Some however turn into confrontations with the South African Police Service (SAPS), who have been criticised for using excessive force in dealing with demonstrations it perceives as unruly or destructive. One report describes how police killed four peaceful protestors in the first three weeks of 2014. Impunity for police officers involved in the killing of protestors heightens fears that this heavy-handed approach to quashing protests has received political endorsement. Police violence during protests, therefore, is likely to continue. No officers have been convicted for the killings of Andries Tatane, Mido Macia or the 34 miners killed at Marikana on 16 August 2012. All three of those incidents were caught on video and widely circulated. South African citizens regularly express their views in public gatherings, on live radio and via print media. Criticism of the government is frequent and, in most cases, permitted. In some instances, however, expressing views openly can have severe consequences. South African citizens regularly express their views in public gatherings, on live radio and via print media. Criticism of the government is frequent and, in most cases, permitted. In some instances, however, expressing views openly can have severe consequences. The ‘Right2Know’ campaign has documented at least 17 whistle blowers who lost their jobs, faced legal harassment or were killed because of attempts to expose corruption. The media continues to expose much wrongdoing by public figures in South Africa, however new ownership patterns are emerging that mean large sections of the print and electronic media are now controlled by individuals with close ties to President Jacob Zuma. The national broadcaster, the South African Broadcasting Corporation (SABC), continues to be accused of pro-government bias. In a directive that was dismissed by much of the media and public, SABC chief operating officer Hlaudi Motsoeneng ordered the SABC to report 70% ‘good news’. Recently, on the international stage, the South African government has refused to support an application by the Committee for the Protection of Journalists (CPJ) to get consultative status at the UN, claiming that the CPJ does not fully endorse the limitations on free expression imposed by Article 20 of the ICCPR.